The new edition of Personality Disorders continues to provide an in-depth guide to personality disorders, assessment and treatment, across varied patient groups and settings. Grounded in scholarly review and illustrated with a diversity of case studies, this book covers familiar ground with comprehensive detail, including the description of personality disorders, diagnosis, epidemiology, aetiology and treatment strategies. Furthermore, this new edition reflects changes in the new ICD-11 and DSM-5, assessment instruments, and state-of-the-art insights from theory-driven research. 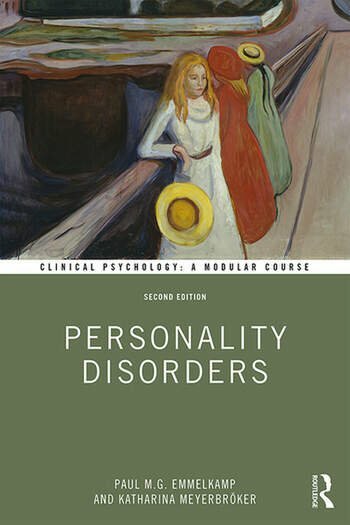 Part of the popular ‘Clinical Psychology: A Modular Course’ series, Personality Disorders offers excellent coverage on all aspects of personality disorder, and will be extremely informative for students and practitioners alike. Paul M.G. Emmelkamp is Professor of Clinical Psychology (ret.) and affiliated with the University of Amsterdam. Katharina Meyerbröker is Assistant Professor of Clinical Psychology at Utrecht University and is affiliated as a licensed mental health psychologist at the mental health care institution Altrecht. 'The revised edition of this book is bang up to date and is an excellent primer to the subject. Emmelkamp and Meyerbröker have comprehensively described the jigsaw of personality disorder, in which the major pieces are well demarcated but their place in the overall pattern still remains a puzzle. What they also make clear is that personality disorder cannot be ignored or dismissed as a useless label. It is fundamental to the proper understanding of the psyche."